Prior to the Great Recession, the housing bubble was eating into vast swaths of what makes New Jersey the Garden State. During that time I personally saw many wonderfully charming, quite rural roadways straightened, blown out and widened to modern “safety standards” to accommodate large new car-dependent developments and traffic demands 30 years into the future. With a slight uptick in the economy my rides have once again been filled with the sight of new housing starts like that seen below. 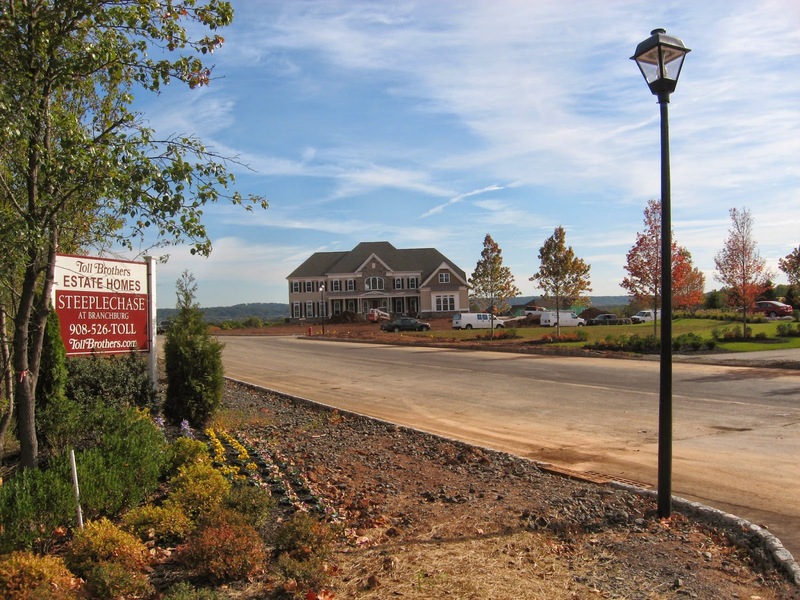 While the rediscovery of urban centers and urban living have been absorbing much of the housing boom here in New Jersey, old habits still seem to die hard here in our state. Also the massive amounts of wealth being generated in New York City and the region make the dream of a house out in “the country” (well it was the country till all of you moved here) all too attainable and attractive for those who can still easily afford this style of living. We’ve talked about the connection between sprawl and the degradation of New Jersey’s wonderful rural road cycling before (if you don’t understand it, read that old blog article). Luckily there is something we can all do to slow and hopefully stop New Jersey sprawl once and for all. On this Election Day you can vote YES for Ballot Question #2 which would permanently dedicate a small portion of the state corporate business tax to fund openspace preservation, park maintenance, new trails (!) and new park facilities. Support is strong for this question in the local New Jersey media. Elsewhere on the Network today: The Transportationist sets out to determine which is a bigger risk: car collisions or pollution caused by cars. Vibrant Bay Area writes that there aren’t enough smaller homes in America for the growing number of seniors who want down-sized, walkable living. And City Block says there’s a “missing middle” in urban housing: the increasingly rare duplex and other small multi-family units.